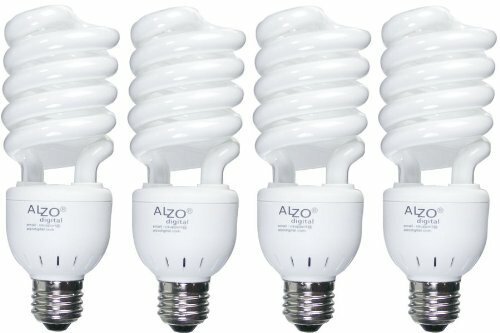 Home › Energy-Efficient LED Lighting › Alzo 27W Joyous Light Full Spectrum Cfl Light Bulb 5500K 1300 Lumens 120V Pac..
Alzo 27W Joyous Light Full Spectrum Cfl Light Bulb 5500K 1300 Lumens 120V Pac..
Case of 4 full spectrum 27 watt light bulbs that imitate daylight, are energysaving, and have a long life of circa 10,000 hours with 1300 lumens output,120V; low energy consumption, good for starting plant growth. These arecompact fluorescent light (CFL) bulbs that fit all medium-base E27/E26sockets, but the large bulb size might create a fit problem with standard lampharps of household light fixtures; a larger lamp harp is needed, see ALZO 9inch lamp harp. Dimensions: Length: 6.5 inches; Width (Diameter): 2.25 inches;Length socket base to top of ballast: 2.75 inches; Width (diameter) of socket:1 inch. Important: ALZO CFL bulb life is based on the bulb in an open airupright orientation. When ALZO bulbs are installed in fixtures that lackadequate ventilation, the life of the bulb will be reduced. If an ALZO CFLbulb is installed in an overhead recessed light fixture with the bulb glassbelow the base, the life of the bulb will be greatly reduced.